Unless noted otherwise, all track links are of the outside guide, rubber bushed double pin type. A Sherman track is made of shoes. A shoe is an assembly of one link, two connections (a.k.a. end connectors), two wedges and two nuts. The shoes have a part number, as well as the links. For example, the T41 track is made of a shoe having the part number D37889 and a link having a part number C73922. T32E1, T33E1, T35, T35E1, T36E2, T36E3, T36E4, T36E5, T37, T37A, T37E1, T40, T41, T41E1, T41E2, T41E3, T45, T47, T47E1, T48, T48E1A, T48E1B, T49, T50, T51, T53, T53E1, T54, T54E1, T54E2, T54E3, T56, T56E1, T59, T59E1, T60, T61, T62, T63, T65, T67, T74. Those in bold were approved for production. pitch: 6"; pin diameter: 1-1/8"
Flat reversible rubber tread (photo courtesy of Massimo Foti). Produced until at least March, 1943. The T41 had smaller pins but more notably was much thinner (3-1/4 inches) than the T51 (3-3/4 inches) with equal amounts of rubber on each side. Non-reversible rubber tread with 'double I' pattern. Officially listed as 'Rubber Standard' but better known by its part number WE210 (being an assembly of four track links). Made for the Commonwealth Armies. The evidence suggests that all the Grants were built with these, & that a certain number of spares were ordered. Seen on British and Canadian Sherman IIIs (M4A2s) in Sicily and Italy. WE210 track sets were supplied as replacement tracks in North Africa, and were used on Shermans after the Lees and Grants were phased out. WE 210 tracks have also been seen on RAM tanks in Canada, and on Sexton SPGs. The period photo shows an M4A2 of the Polish 2nd Armoured Brigade, 4th "Scorpion" Armoured Regiment in Monte Cassino, Italy, 1944. This Sherman is fitted with WE210 tracks. width: 16-9/16"; pitch: 6"; pin diameter: 1-1/4"
Flat non-reversible rubber tread. Replacement of T41, tread with thicker rubber to prolong track life. Compared to the T41 track, the T51 was asymmetrical: 1-9/16 inches thick on one side and 2-3/16 inches on the other. Chevron rubber tread. This link was the longest in production of the rubber tread types, as post-war production T48 tracks with wide guide horn connectors have been spotted. Chevron steel tread, composite welded links. Note: a variation of this type of track has been spotted on an ex-British Sherman V fitted with T49 track. It is constructed like the T54E1, but instead of a chevron, it has three bars welded on the tread plate. Thus it looks like T49 track, but it is not. Chevron steel tread (composite welded links?). 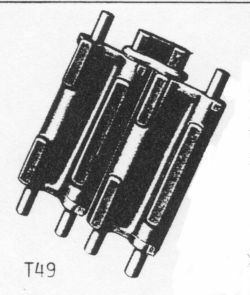 First steel tread link, known as 'cuff design' (later designated T54E2). Designed and manufactured by Chrysler. First fitted to Shermans on 01-10-1942. Replaced by a 'rolled section track' (originated by Mr. Weckler) in the Spring of 1943. Chevron steel tread, composite bolted links (notches in chevron to accommodate bolts). Note: both T56 and T56E1 seem to be based on rubber block track links. The frame of the rubber block link is not cast in rubber, but clad with a straight and chevron steel tread, respectively. The tread plates are fastened with three square-headed bolts. Chevron steel tread, composite rivetted links. Chevron steel tread, rubber top. Spotted in post-war use with wide guide horn end connectors. width: 16-9/16"; pitch: 6"; pin diameter: 1-7/16"
Straight steel tread, hollow cast steel link. Limited use only. Ram tanks: supplied as spare only. T47 D48072 shoe, C55597 link. The T47 road face looks essentially like the T56. Straight steel tread (three square dimples between bars), rubber top. T56 D58641 shoe, C106496 link. Straight steel tread, composite bolted links. Straight steel tread (recession between bars), rubber top. Straight steel tread, cast steel links (looks like T47E1), but without the rubber pad on the top.